LIMA, Peru -- A funny thing happened on the way to a 2015 climate deal: The wall dividing developed and developing countries crumbled. It happened almost in an instant, as no one was really looking. And it certainly has not stopped pitched battles at U.N. global warming talks here over keeping it intact. But, representatives from rich and poor nations alike said this week, the moment Chinese President Xi Jinping stood by President Obama in Beijing and vowed to peak carbon emissions without demanding aid for China or others in return, things changed. The two leaders effectively took jackhammers to the U.N. architecture that defines countries as either Annex I (developed) or non-Annex I (developing) and assigns responsibilities accordingly, driving a wedge through 20 years of international negotiations. "You had China and the U.S., the two biggest polluters, come out together, and they didn't call themselves 'Annex this' or 'Annex that,'" said Saleem Huq, a senior fellow at the U.K.-based International Institute for Environment and Development who works closely with a group of least-developed countries in the talks. "That was the de facto death of the annex system." While the bright-line distinction between developed and developing nations may be faded, no new system has yet taken its place. Attempts to either preserve it or come up with a new one are the essential fight this week in the efforts here to design a new international climate accord. As part of the new agreement, which will be signed in Paris next year, all countries are expected to tackle carbon emissions for the years after 2020 and will have to reveal their pledges by June. But while the United States and Europe want to see those targets, include mitigation numbers, many developing countries are calling on the West to also include more specific information than others -- as well as what levels of finance they will provide to the developing world. "Finance is required for developing countries to get on low-carbon development pathways and adapt to the climate impacts they are already experiencing," said Kelly Dent of Oxfam International. She described U.S. and E.U. efforts to remove references to finance as "putting a blindfold on developing countries and saying, 'Please trust us.'" The issue gets to the heart of the future of the annex system. Not only do wealthy countries oppose signing on the dotted line to certain levels of climate funding over the coming decades, but they also fear that doing so would preserve a static system in which only they are formally obligated to cut economywide emissions and deliver dollars. On the other hand, many developing countries -- which have seen wealthy countries like Canada and Japan turn their back on the Kyoto Protocol and others fail to deliver either the emissions cuts or money they once promised -- have little trust in a new system that they fear could let rich countries off the hook entirely. The debate has become so jagged that the co-chair of the U.N. body designing the new agreement has called on ministers arriving this week to weigh in, said Alden Meyer, director of strategy and policy for the Union of Concerned Scientists. "The parties are so dug in on their fundamentally different views of the world," Meyer said. "We know we're not going to get the 'Hallelujah' chorus here ... but they need some guidance from ministers about how to cross these divides and get to yes." While a group of nations led by India, Venezuela and Saudi Arabia -- and nominally China -- are strictly against renegotiating the annexes, a number of developing nations have proposals on the table. One plan getting a good deal of attention this week is from Brazil, which has proposed a system its government calls "concentric differentiation." It would create an inner ring of countries -- those now known as Annex I -- that would take economywide emissions cuts; a second ring of emerging powers like Brazil that still are dealing with serious development issues, which would have various options for presenting their emissions targets; and another group made up of the poorest nations, which would be encouraged to act on climate change but would not be formally obligated to do so. Brazil's chief negotiator, Ambassador Antonio Marcondes, said the government realized that the effort to define nations' responsibilities "needed a fresh approach." 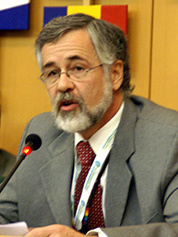 Brazil's climate negotiator, Ambassador Jose Antonio Marcondes de Carvalho. Photo courtesy of IISD Reporting Services. "It has the advantage of being dynamic," Marcondes said. "Countries can move inwards. That's the only direction of travel." But he also noted that the proposal does not tinker with the fundamental principle of "common but differentiated responsibility," which is embedded in U.N. climate convention and which for years has helped to enshrine the annex system. "We are not touching on the convention. The convention remains intact," he said. "This is a way to break the gridlock, preserving the convention but allowing over time for countries to move inwards." Some, like International Emissions Trading Association President Dirk Forrister, who while working as a climate aide in the Clinton administration worked on new ways of defining countries' responsibilities, said the Brazilian idea "creates a middle ground." Harvard University economist Robert Stavins argued that the Brazilian idea essentially preserves the old annex system. "What's needed is much more sophisticated than that," Stavins said. Meanwhile, South Africa has pitched the idea that every country should establish a zero-carbon development plan, while a group of progressive Latin American countries have also called for more flexible treatment of the annex system. Nat Keohane, vice president for international climate at the Environmental Defense Fund, said simply the fact that so many developing countries are thinking outside of the old annex box is significant. "Seeing countries talk about this in a new way, not just using the same language they've used for 20 years, is really interesting," he said. The United States, for its part, calls its idea "self-differentiation": that is, allowing each country to decide how much it can do domestically and not forcing others to take on any certain level of carbon cuts. The approach is underscored in the U.S.-China deal itself, which saw the the Obama administration pledge to cut emissions 26 to 28 percent from 2005 levels by 2025. As part of the deal, the joint statement said, both the United States and China "are committed to reaching an ambitious 2015 agreement that reflects the principle of common but differentiated responsibilities and respective capabilities, in light of different national circumstances." The idea is seeing some serious resistance. Marcondes, for one, said, "We think it's a departure from the convention. The convention provides for differentiation, and we think the idea of self-differentiation is a departure from that." But others say that no matter how diplomats here ultimately end up defining themselves, they will probably enter a far more voluntary, bottom-up system than the one that exists now. Caleb Christopher, legal adviser to the Marshall Islands, said: "We've almost solved the differentiation debate without solving it. There's an expectation that many countries will be coming forward with what they can do."